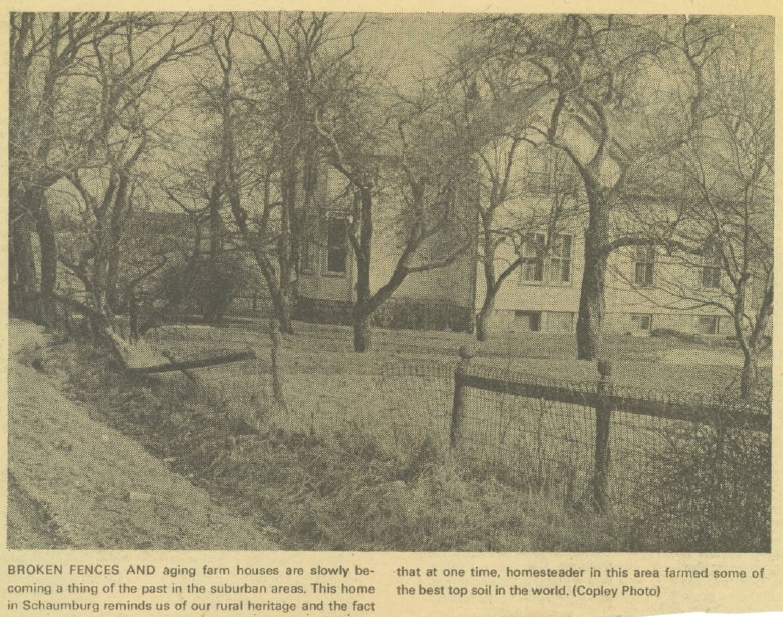 While going through some older newspaper clippings, I came across these two buildings that were pictured prominently in the Record. The first one did not have a year but, since all of the clippings appeared to be from the early to mid 1970s, I presume that is the time period. I am trying to determine their location in the township. If you can help out, please leave a comment or send me an email at the address below. Unlike many farmhouses that sit on a rise, this one is clearly below grade and sits in a lower spot. 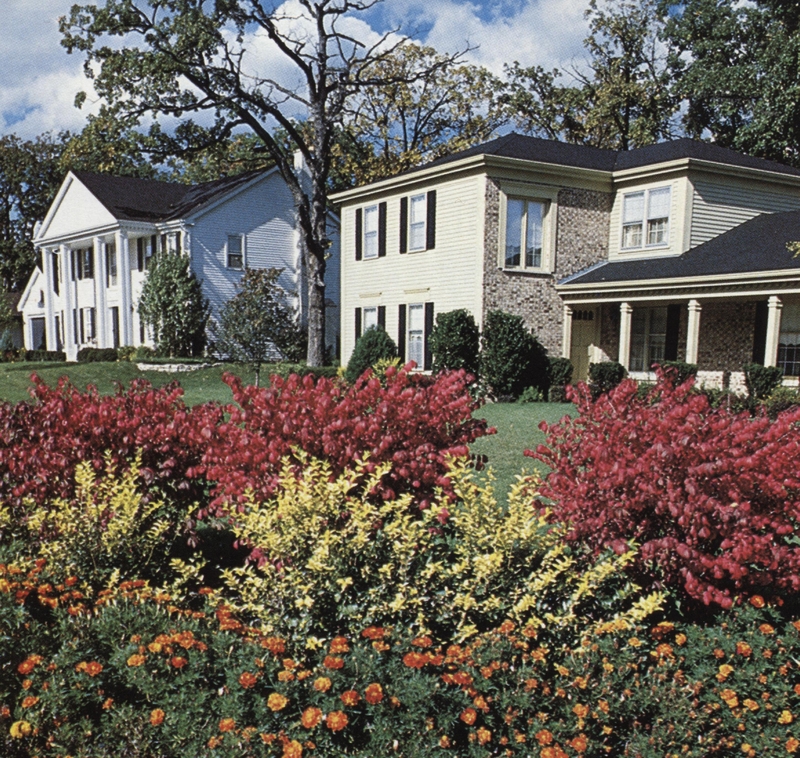 It is surrounded by a circle of trees and a fence, and has a basement that is as large as the house itself. Other than that, it is difficult to garner any other clues in the background of the photo or in the building itself. 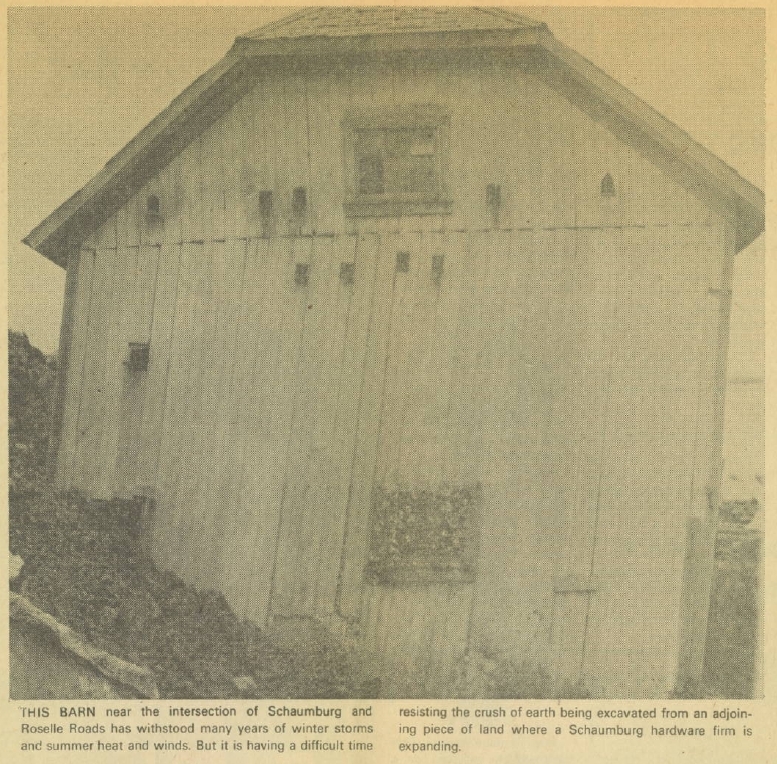 So, for those of you who remember that time period, is this the barn? If it is, I will definitely change the Ace Hardware posting to reflect the fact that the building was added onto in 1972. I’m just waiting for confirmation! This photo has been in our collection for quite a while and it is a puzzler. The back of the photo says, “Once Upon a Time” and is dated 03/04/81. Upon first glance, it seems it might be Woodfield Mall, due to the amount of open space and the size of the project. The background is what throws that supposition off. 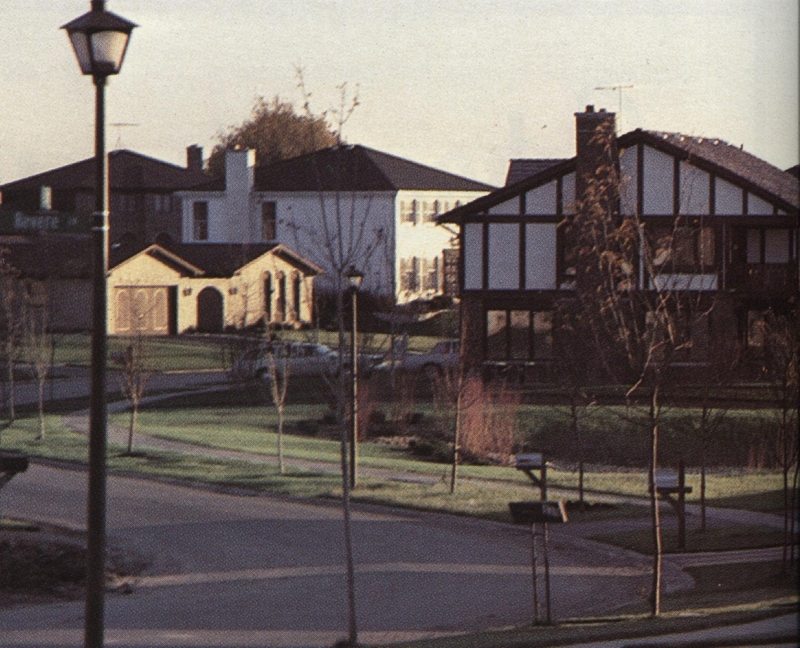 Even though there appears to be a farm in the middle background of the photo, there is also a hint of a neighborhood in the upper left of the photo. And that was simply not the case in the area that surrounded Woodfield prior to construction. An aerial photo of that locale in 1969, before construction began, would have shown only farmfields, houses, barns and outbuildings in a checker board pattern. 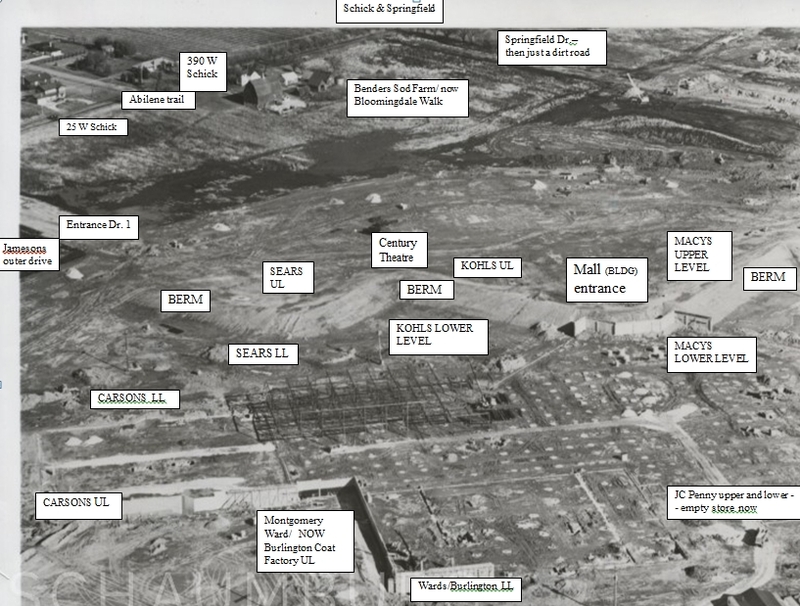 There would not have been a grid layout of streets and houses anywhere close. It also appears that the area was excavated, given what looks to be an accentuated incline that runs behind the building. It is also curious that there are a couple of buildings in the foreground of the photo. One appears to be a barn and there is a type of drive-thru garage to the left with two construction trailers in between. Interestingly, there is a power pole behind the garage. Which begs the question, were these buildings there before development began and then incorporated into the construction site? I strongly suspect this is not Woodfield. Is it even Schaumburg Township? The only other clue is that the photo came to us with a collection of other local and regional photos. Sooooo, it could be another suburb. Do any of you have a clue? ***Photo identified! In addition to the comments from JKunzer below, I also received an email–with photos attached–from another reader of the blog explaining why this is Stratford Square Mall under construction. Through their views it is not only possible to compare the basic shape of the building in the photo to an aerial of it on today’s Google Satellite, but both commenters agreed that the angular walls along the berm are, in fact, near the rather unique northwest mall entrance that is between Kohl’s and Macy’s. And, as local realtor Bob Dohn noted, the mall opened in 1981 which makes the date on the back of the photo even more relevant. JKunzer also mentioned that the farm is the current Bloomingdale Walk town homes. Leslie Drewitz, Maretta Britt and Abby Budznynski of the Bloomingdale Public Library graciously assisted me too, and passed the photo back with identifications tabbed all over it. You can see their handiwork below. The farm in the background of the photo is the Benders Sod Farm which is, as JKunzer said, today’s Bloomingdale Walk town homes. 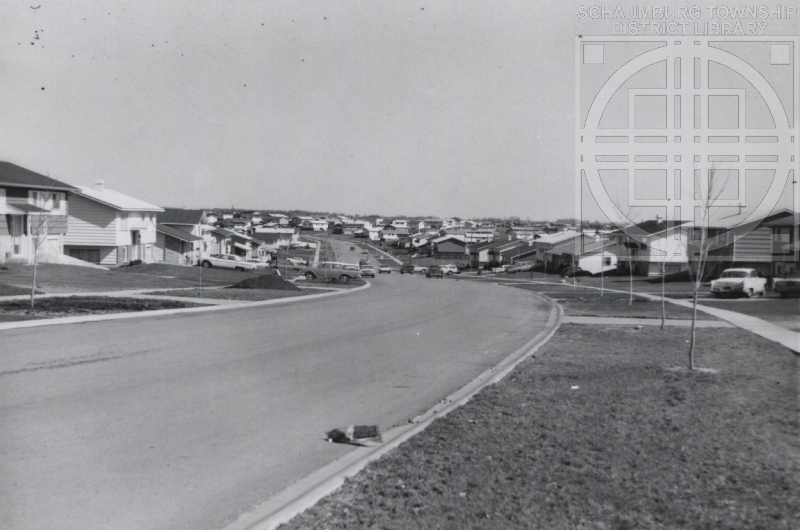 The diagonal corner behind the farm, in the very background of the photo is the corner of Schick Road and Springfield Drive. Springfield is just a dirt road that runs to the right. Schick Road is the diagonal road that runs to the left of the photo and separates the farm and the subdivision. Abilene Trail is the road running through the subdivsion. The road at the left middle part of the photo is the Entrance Drive to the mall that is emptying into the excavated property. The far left portion of the mall being excavated is today’s Carsons. Montgomery Ward’s/Burlington Coat Factory is in the undeveloped portion in the very forefront of the photo. The closed J.C. Penney portion is in the right forefront. The left portion of the skeletal structure is Sears lower level and the right portion is Kohl’s lower level. Macy’s undeveloped lower level is on the far right of the photo. 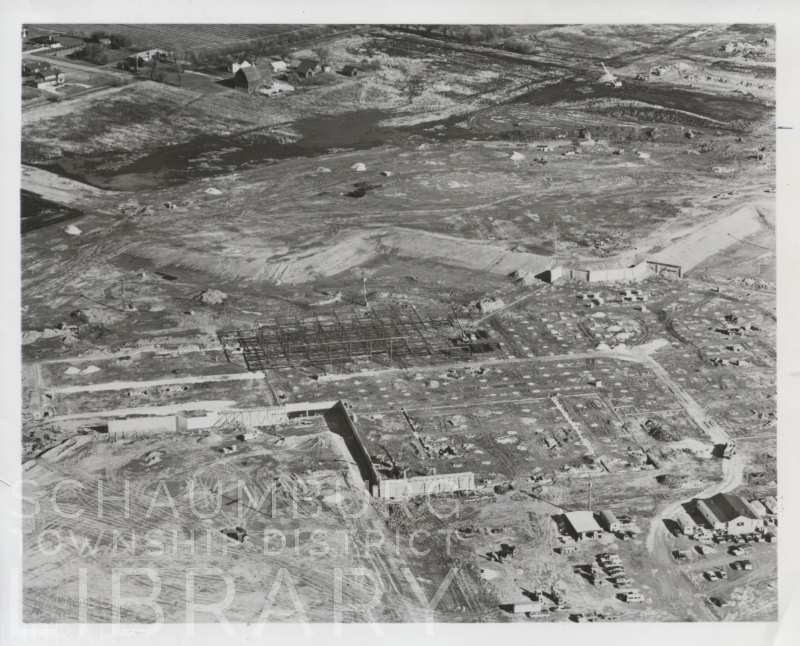 In the very middle of the photo, above where two sections of the berm meet, is the location of the current Cinemark Century Theater. All of the clues provided by contributors were a big help in determining the photo’s subject and the many details in the photo. Many thanks to all of the commenters for their analysis and the identification methods they used to determine the identity of the photo. Your collective brains are always much appreciated! The photo below shows a group of parishoners of St. Peter’s enjoying some time at a bowling alley. Judging by the clothes, the time frame is either the 1950s or the early 1960s. Hoffman Lanes opened in 1961 and I’m hoping this photo shows their interior because that would be a neat addition to the collection. It looks, though, like many bowling alleys of that time period so it could be any one of a number of bowling establishments. Can anyone possibly discern which bowling alley it might be? 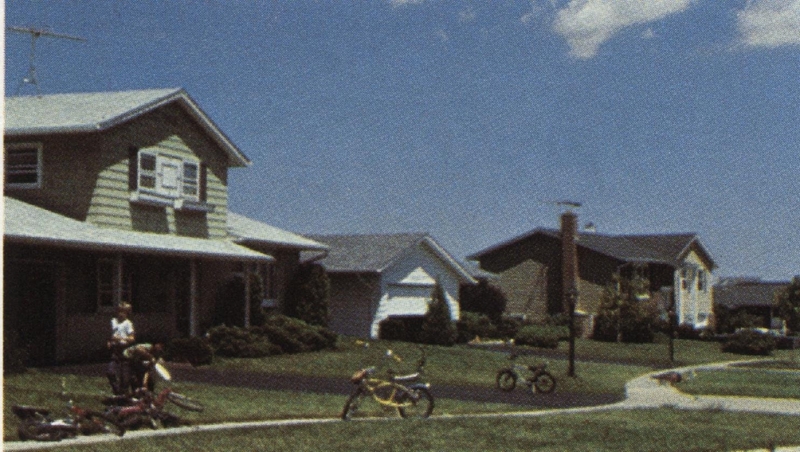 This next photo obviously depicts a very new subdivision in our township. 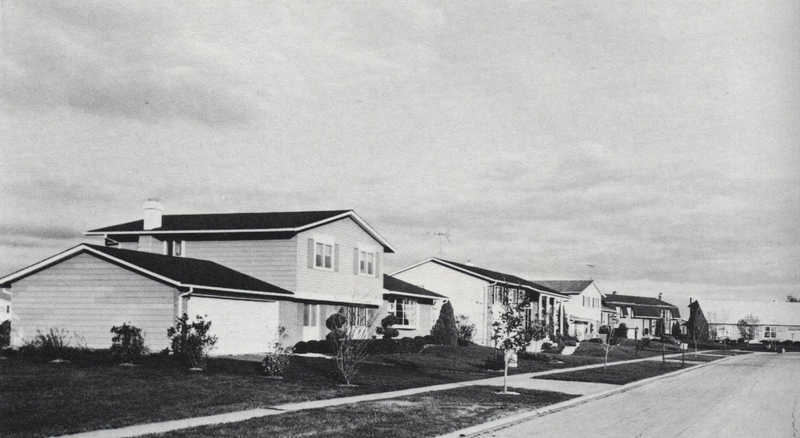 Distinguishing characteristics are the very young trees in the parkways, the fact that there is curb and gutter edging the street, the subdivision is built on a slope and the car on the right looks like it was probably from the 1950s. The back of the photo says ca. 1963. 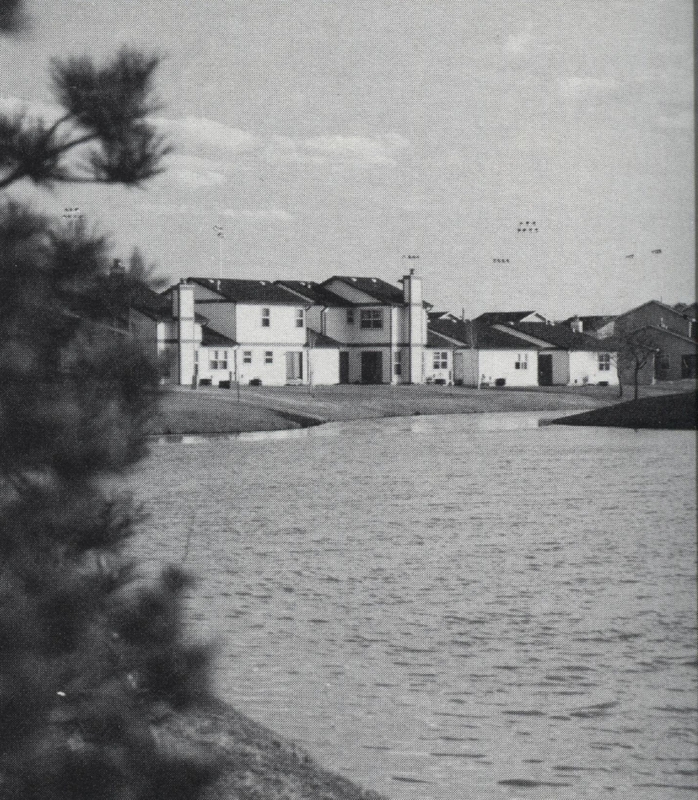 Any ideas about which subdivision this might be? As always, your assistance is much appreciated! 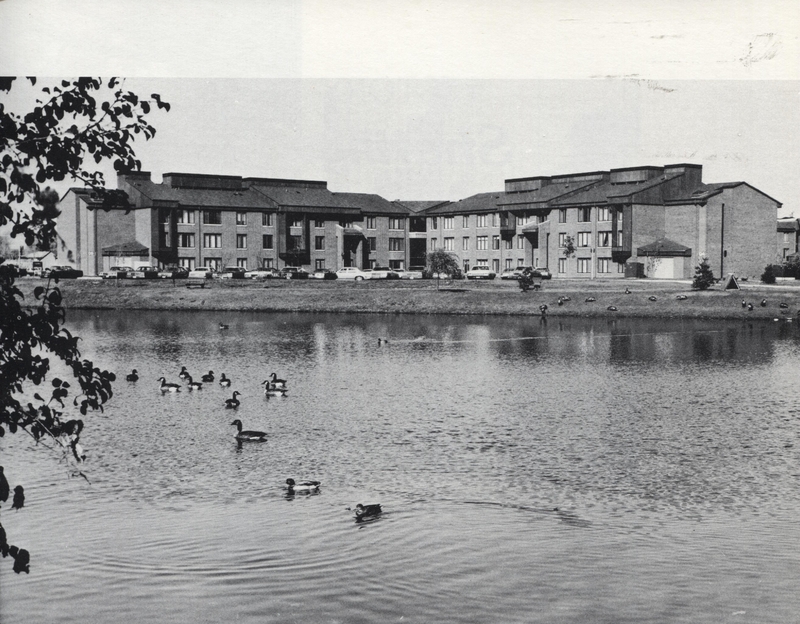 These two photos are part of the library’s collection and appear to be taken in the late 1970s or early 1980s. The top photo is clearly the St. Hubert’s Teen organization. My feeling is that it was taken during the Hoffman Estates Fourth of July parade or it could be the Septemberfest parade. 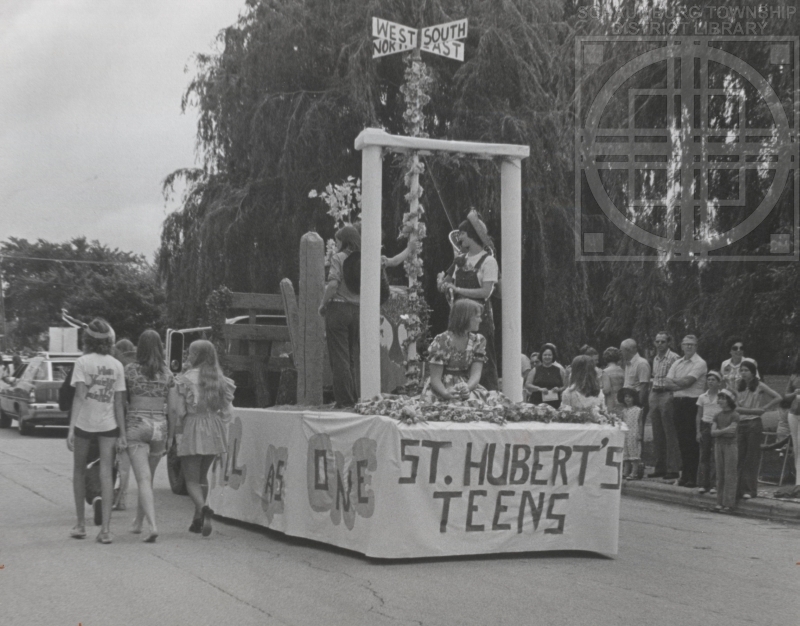 Do any of you out there recognize the float–and possibly the year? 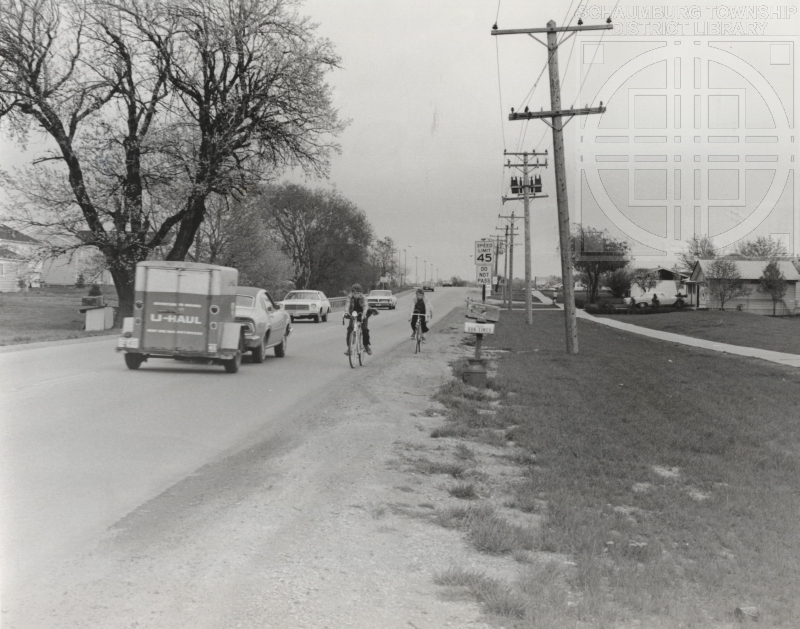 The second photo may or may not have been taken in Schaumburg Township because there are a few extemporaneous northwest suburban photos in the collection. Taking a deeper look at the photo, it is possible to see that there is a School Zone sign further down on the right side of the road as well as a 20 mph sign that denotes the upcoming school zone. The school is obviously on the left side of the road and, judging by the tall overhead lights, is probably a high school. My first thought was Conant but there are no single family homes on the same side of the street as one approaches that school. That area is all Dunbar Lakes, a townhouse development. My next thought was the school is Schaumburg High and we are looking east down Schaumburg Road. Clearly there is no curb and gutter and the power lines were overhead when this photo was taken. What do you think? Is that a possibility? Or could it be a junior high? 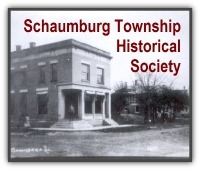 Or is it just not Schaumburg Township? Your thoughts and suppositions would be most helpful! CAN YOU HELP IDENTIFY THE LOCATION OF THIS PHOTO? This photo was recently donated to the library and appears to be a group of young men on a field trip with their teachers and/or chaperones. They seem to be of high school age and two of them appear to be wearing 4-H shirts. 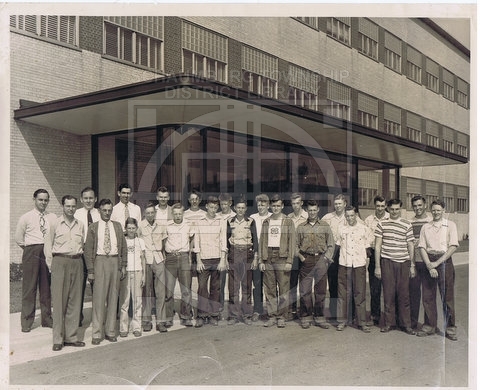 Because one boy in the group has been identified, and we know the years he was in high school, it is possible to put the date of the photo between the years of 1949 and 1953. Given the fact that the identified young man grew up on a farm in Schaumburg Township, it was not a stretch to wonder if this is a group was associated with the Cook County Farm Bureau, a 4-H club, a high school agriculture class or a group of Future Farmers of America. After a bit of newspaper research, I did in fact discover that he was involved in a Schaumburg Township 4-H club. He won prizes at the 4-H fair for raising cattle and swine and served as recreation leader for the group. Which brings us to the location of the photo… I’m curious about the building behind them. It looks to be a Chicago area high school or an office building. Can anyone help place this structure? Here’s hoping the collective brain can figure it out!